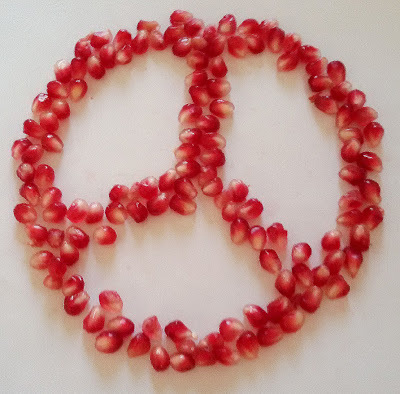 Pomegranates are now in season in Israel and are a prominent part of the Rosh haShana and Sukkot menu. If you know any Jewish people, you have probably noticed that they have a LOT of holidays. This may seem like a lot of fun. Lots of time off from work. Lots of time to relax with friends and family and stuff yourself with amazing food. Happy times all around. Rosh haShana, the Jewish New Year - A time to reflect on the past year, regret all the bad stuff that you have done and to pray (a LOT) that God will grant you another year and that things will reasonably go well. Yom Kippur - A 25 hour fast. And not just a 'do not eat food' fast. A fast where you do not eat or drink, brush your teeth or even wear anything made out of leather. This day is basically your final chance to atone yourself and pray for a good new year. Most of the religious Jews spend the entire day in the synagogue. Hanukka - Celebrating the miracle that the only holy oil left to keep the destroyed Temple's menorah lit, kept on burning for eight days until a fresh batch arrived. The Jews managed to rededicate the Temple after it was vandalized but these times ( 215 BC – 164 BC) were a very difficult time for the Jews in Israel. Purim - Celebrating the fact that Jews were not annihilated in ancient Persia during their exile from Israel. Lag Be"Omer - Celebrating the fact that a devastating plague stopped on this day. Tisha be Av - Another fast day to remember all the bad things that happened to Jews on this date; the first and second temple was destroyed on this date. Jews were also expelled from England and Spain on this date. Passover - Celebrating the fact that the Hebrews finally managed to get away from a life of slavery in Egypt. Now in modern times, Passover is preceded by an intense and exhausting spring clean and during Passover itself you are not allowed any yeast products. No bread or beer for an entire week! Just about all of the holidays have the theme of: "Someone tried to annihilate us. Didn't work. Let's eat." or " Pray as lot as you can"
Not exactly a barrel of laughs, is it? Two of the exceptions are Shavuot (that marks the giving of the Torah, the Jewish bible on Mount Sinai) and Sukkot. Sukkot is basically every Jew's happy holiday. This holiday commemorate the sheltering of the Hebrews in the desert after they fled out of Egypt. And how do they celebrate Sukkot? By building little huts in their yards and on their porches. How cool is that? All your meals should be eaten in your sukkah (little hut) and adventurous souls even camp out the night there. Here in Israel Sukkot is also celebrated with art festivals, music shows and activities for children. A fun time for everyone. Lots of Israelis go on hikes around the country or even go camping. The days are still nice and sunny but the terrible heat of the summer have turned down a notch or two. Sukkot is the Jewish holiday were you are SUPPOSED to be happy and have a good time. Just like all the other holy days of all the other religions. But then terrible things happen. This Sukkot a young couple, Eitam and Naama Henkin, was gunned down in their car in front of their children in northern Samaria. Their children (ages, 9, 7, 4 and a 4-month old baby) were not physically hurt. And in Jerusalem a family (two parents, a 2-year old toddler and a baby) was attacked with a knife. The father and a Jewish bystander who came to their help were killed. The mother was also stabbed and as she pleaded for help for her two small children, she was spat on and told to die. The terrorist was eventually shot dead by security forces. In two separate attacks, a 5-year old boy and a 16-year old girl were shot at while they were in their sukkah. A full list (and hopefully final list) of the terror attacks against Jews the last few days can be seen here. Every Sukkot now, these victims will be remembered. Instead of enjoying a happy carefree Sukkot, every Jew all over the world will enter this happy holiday sadly, with a touch of apprehension, but still with determination to celebrate the holiday. In spite of everything. So the next time you know that a Jewish person is celebrating his or her holidays, don't wish wish them "Happy Holidays". Instead, wish them a PEACEFULL holiday.